It was the 1920’s and America was roaring. The Great War was over, the United States was coming into its own. We were changing everything; we put the world on wheels and now we were altering the face of city skylines with the skyscraper. 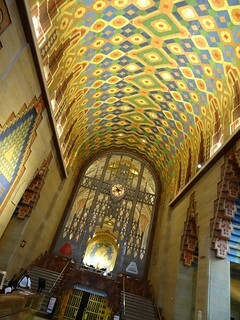 In Detroit buildings such as the Buhl, Book Tower, Fisher and Penobscot soared high towards the sky, in 1929 the Guardian Building joined them. Originally named the Union Trust Building, Wirt Rowland of Smith Hinchman and Grylls Associates was responsible for designing the structure, and what a grand job he did! 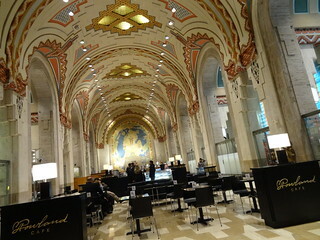 The Guardian looks as good today as it did in 1929; home to a branch of Bank of America, Pure Detroit, a coffee shop, cafe and City of Detroit offices, hundreds of people come and go from the building each day, free tours are available too. 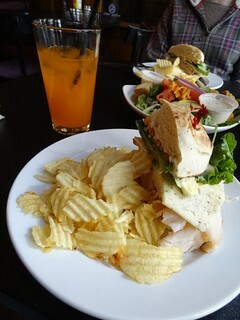 Let us show you around. Located on Griswold Street in the Financial District, you can easily pick out the Guardian; while most buildings are made of limestone or granite, Wirt Roland chose a red-tan brick, I read that almost 2 million bricks were used to construct the 535 foot building. Be sure to spend some time taking in the exterior of the building; on either side of the main entrance Indian-like figures carved by Corrado Parducci represent safety and security, colorful tilework patterns enhance outdoor alcoves. 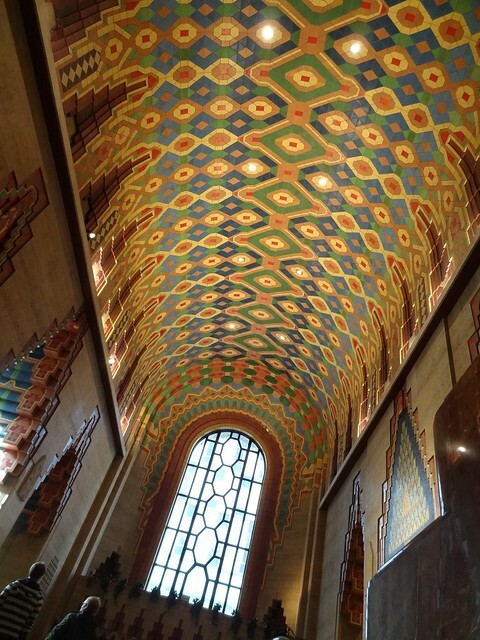 Once inside be prepared to be awestruck, the lobby is magnificent. 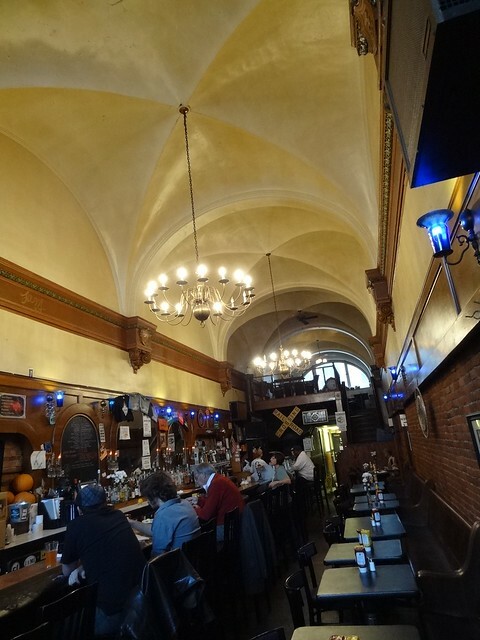 The vaulted ceiling is Rookwood tile from Cincinnati, colorful patterns in blue, green, yellow, red and gold dance across the space, floors are Italian Travertine and Belgian black marble, lower portions of the walls are Numidian marble and Mankato stone. It is here we meet up with our tour guide and Guardian Concierge Christopher; his enthusiasm for the building is apparent the moment he begins to tell us about it. 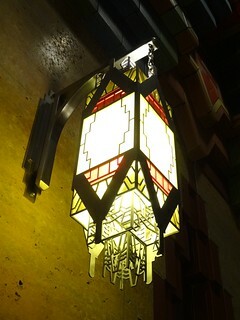 The building itself is an Art Deco masterpiece, keep in mind it was built as a banking institution. The Indian motif is carried on throughout the entire structure; we find symbols of security, fidelity, safety and progress. 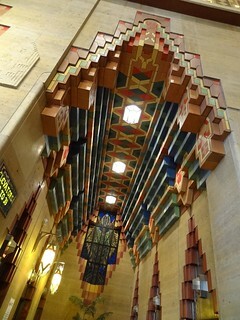 Notched arches line the length of the lobby, at the end of each elevator hall are majestic stained glass windows featuring elaborate Indians. Our guide points out splendid lanterns that MichCon had made from the original architectural drawings found when doing renovations. Elevator doors are fabulous; Christopher shows us the letters UT carved into the doors representing Union Trust. We hop on the elevator and go up. 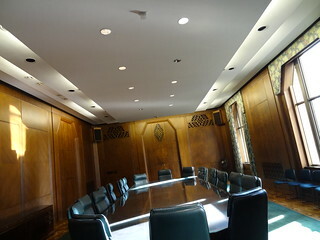 We stop on the executive floor; CEO’s, CFO’s and board members gathered here for important meetings, it’s very swanky. Beautiful wood lines the walls and floor of the outer area, inside the boardroom a huge conference table and chairs take up most of the space; walls are beautifully paneled, windows are tall and elongated and provide a picturesque view of downtown. Back in the elevator we stop when we reach the top floor: the Ballroom. The decor is reminiscent of the lobby; notched arches, bright colors, but here we get a panoramic view of the city and the river, wow! This time we ride the elevator back to the lobby, then head down the stairs to the safe. As we descend the design becomes less intricate, but it is not without decoration; Flint Faience tiles add a splash of color. We arrive at the safe, all of us walk inside as Christopher explains how cash was stored in piles back in the day. 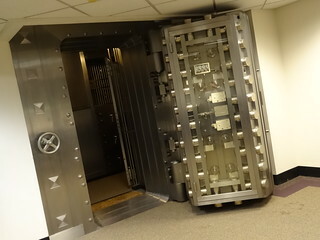 As we exit we stop and examine the door, they didn’t kid around when it came to protecting money. A small room houses safe deposit boxes, I imagine wealthy ladies wearing hats and gloves making frequent trips here to retrieve their finest jewelry for special occasions. At last we arrive at the Cathedral of Finance, now called the Retail Promenade, it is stunning! 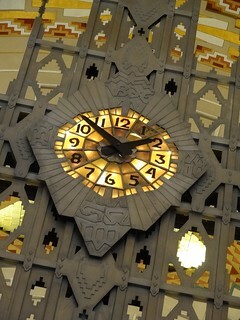 A decorative grill made of Monel metal separates the lobby from the cathedral, a Tiffany clock graces each side of the grill, after many years of being dark it is once again illuminated, it is a true work of art. 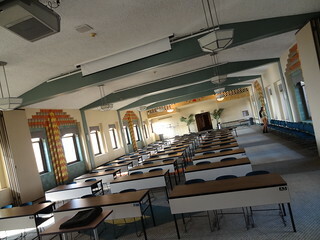 The main banking room was once lined with 80 teller cages, yes, you read that right, 80. 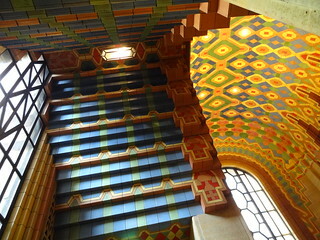 The theme is Aztec design, the ceiling is hand painted in colors popular at the time including turquoise, and terracotta. Oils, acrylics and solid gold were used to achieve the look, it is amazing. The south wall embraces a giant map of Michigan; Michigania, the goddess of our state is placed in the center, symbols of mining, fishing, finance and auto manufacturing define commercial strengths of the time period, it is still in its original condition. 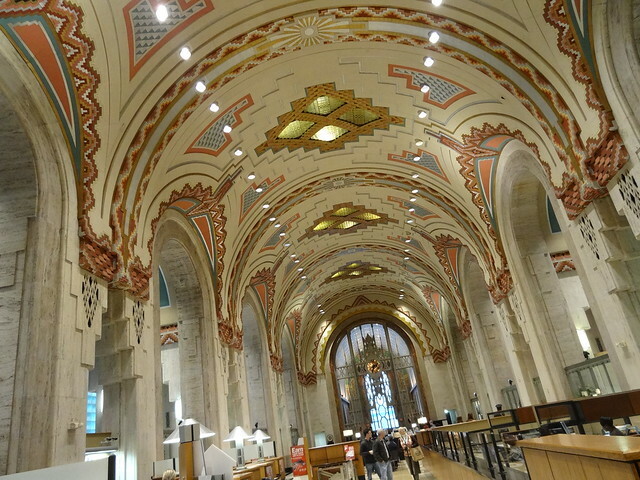 Currently Bank of America continues the banking tradition of the space, who wouldn’t love to do their banking here? There is just so much to look at, it’s hard to take it all in, as many times as we come here I always manage to notice something new. This is where the tour ends, we thanked Christopher for a most enjoyable time. 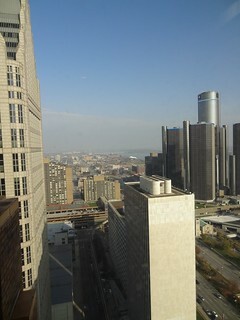 We had a quick espresso drink at Rowland Cafe, you won’t find a coffee shop with a better view, before stopping in at Pure Detroit to check out their latest offerings. 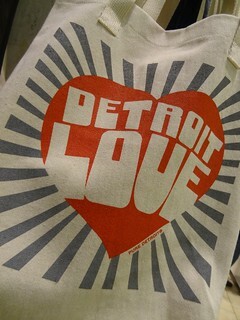 From Detroit themed t-shirts and Pewabic Pottery to original artwork and a vast selection of books, the shop is home to “all things Detroit”. 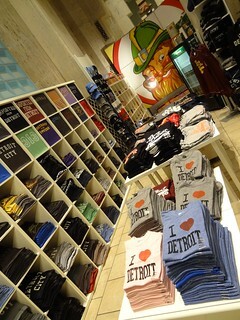 Whether you’re visiting from out of town and looking for something uniquely Detroit to take home or a local looking for a way to show your pride in the city, you’ll find the perfect item here!